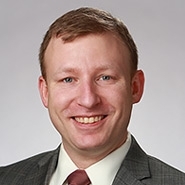 MILWAUKEE, WIS. — The national law firm of Quarles & Brady LLP today announced that James M. Schleicher, Ph.D., has joined the firm's Milwaukee office as an associate in the Intellectual Property Practice Group. Schleicher is a patent practitioner who has successfully guided numerous U.S. patent applications to allowance and has advised on patent validity, infringement, freedom-to-operate, invention patentability and technology landscape. He is fluent across a broad spectrum of technologies and is highly specialized in optics and semiconductors. Schleicher earned his law degree from the University of Michigan Law School, his Ph.D. in Physical Chemistry and his master's degree in Biophysical Chemistry from Yale University and his undergraduate degree, with honors, in Chemistry from the Honors College at Michigan State University.